Ready to get your fish on? Looking for St. George Island Fishing, Apalachicola Charter Fishing or St. George Island Dolphin / Shelling Tours? You are at the right spot! St. George is a barrier island 28 miles long and 1 mile wide at its widest point. St. George Island is adjacent to Little St. George Island. It is connected to the mainland at Eastpoint, Florida by the 4-mile long St. George Island Bridge over Apalachicola Bay. Nearby towns include Eastpoint, Carrabelle, and Apalachicola. The island is known for being quiet and tranquil due to its small size. The Apalachicola Bay oyster bars attract fish by being an outstanding habitat for crabs, shrimp, small fish and other hearty foods. What will we catch? 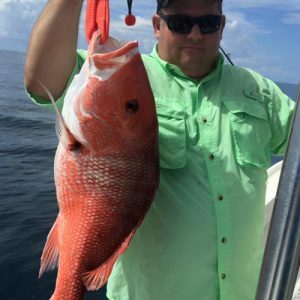 The area is well known for an excellent variety of Apalachicola Bay, St. George Island and Gulf of Mexico fish and seafood including grouper, flounder, redfish, snapper, trout, mullet, black drum, sheepshead, jack crevalle, king mackerel, cobia and others. Be sure to like us on Facebook for updates and follow us on Instagram for pictures of client’s getting their fish on! a great attitude and be ready to get your fish on! Bring the family for some St. George Island fun! Activities include catch and release fishing, seashell searching and dolphin watching. Accommodates up to 5 people, for a 3 or 4 hour trip. Captain LD will take you to all the best Apalachicola Bay and River fishing spots to get your fish on! Try your luck at catching speckled trout, redfish, flounder, pompano, triple-tail and mackerel. Extra $50 for each person over groups of four. Accommodates up to 6 people. Half day or full day trips available. Embark on the thrilling St. George Island shark fishing adventure of a lifetime with Captain LD as your experienced guide! Feel the rush as you catch, take pictures and release these dangerous predators. Bring the whole family along and make memories to last a lifetime! Accommodates up to 6 people. Five hour trip. Captain LD will take you on an inshore and offshore St. George Island fishing trip you’ll never forget! Travel up to nine miles out into the Gulf of Mexico to get your fish on! Catch kingfish, cobia, select snapper, grouper, redfish and speckled trout! Captain LD will make sure to provide a great and unique fishing experience for the whole family! Accommodates up to 6 people with a $50 charge per person over groups of 4. Five hour trip. After a long day getting your fish on, the last thing you want to do is worry about where you’re going to eat dinner, especially if you have a large group. Captain LD’s Tailgate Package is the most convenient solution and is personalized for your group! 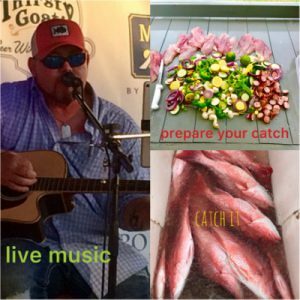 Captain LD will clean, prep and cook your catch for you plus he will provide live musical entertainment. Captain LD will come to you, so no need to go out and fight the crowds, let Captain LD take care of it all so you can continue to enjoy your vacation. Tide Life Charters is dedicated to providing you with vacation memories to last a lifetime! Call (850) 899-3037 for pricing and availability. Come along with Captain LD for a gorgeous Apalachicola Bay sunset cruise. Enjoy watching the dolphins play in the waves created by the boat and learn some educational tidbits along the way. You’ll also get to enjoy some amazing sight-seeing. Watch for bald eagles, ospreys, herons and others! Dolphin cruises are also available in the morning. Accommodates up to 6 people, for a 2-hour trip. Enjoy a fun day of seashell searching off of St. George Island. Go on an island-hopping adventure on some of the barrier islands and comb the beaches for shells and other awesome treasures! Accommodates up to 6 people, for a 4-hour trip. Please contact me today with any questions that you have!